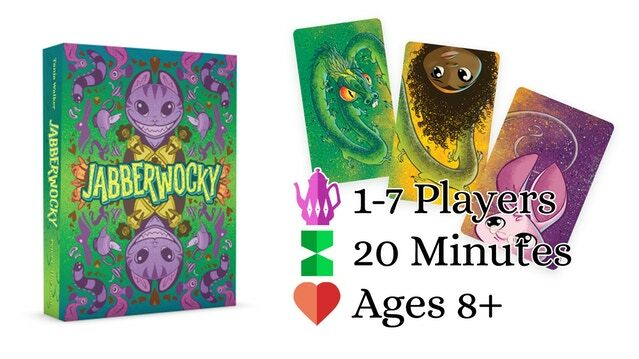 Jellybean Games announced the launch of Jabberwocky, a collection of 5 games in one box. Jabberwocky is the follow-up to the hit game The Lady and the Tiger – reuniting ex-Disney artist Tania Walker and the designer of Dracula’s Feast and Village Pillage, the games included range from a mancala game, an area control game, a solo puzzle game, an asymmetrical map-making game, and a negotiation game that goes up to seven players! gorgeous. Tania Walker has filled the game with delightful characters inspired by the Lewis Carroll poem. online, and the winners were offered publication in the collection. Designs by Joel Colombo, Karl Lange, Marek Tupy, Joe Myron, and Patrick Chapman are included in the box. The Kickstarter has a funding goal of $10,000 – if all stretch goals are unlocked, three more games will be added to the collection: a bidding game by Peter C. Hayward, a bridge-building game by Mark Bethell, and a rummy-style game by John Fowler. Other stretch goals include component upgrades, and unique art for all eighteen cards in the game. Girl Genius is a super-popular webcomic by Phil and Kaja Foglio. It’s set in a very steampunky world and the heroine, Agatha Heterodyne, is a mad scientist and inventor. Or, as polite people put it, a “Spark”. 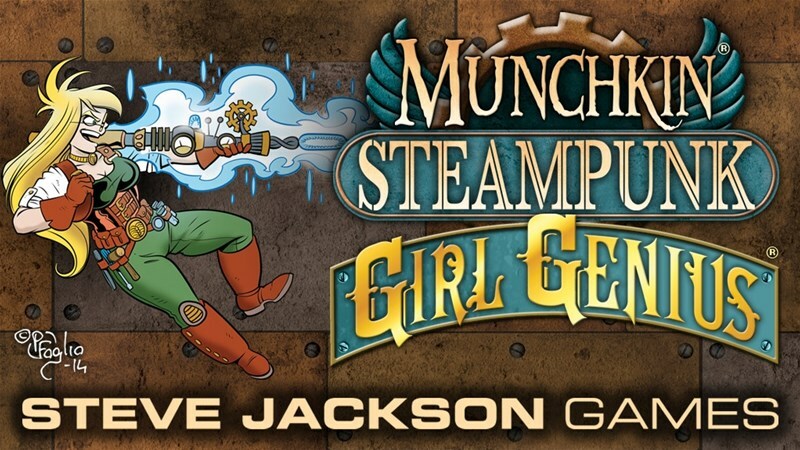 Munchkin Steampunk, Girl Genius, on Kickstarter now is an expansion for Munchkin Steampunk. The set includes Agatha, her friends and foes and rules for becoming a Spark and using Mad Science to improve your items – all the better to destroy your foes, grab their stuff and win! 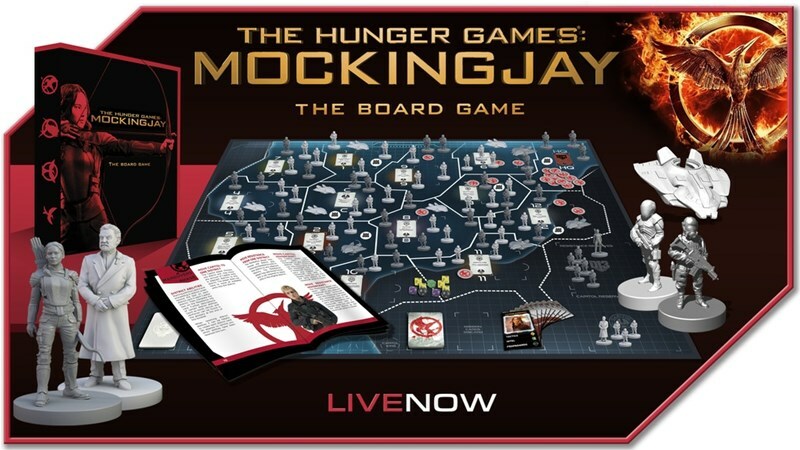 Riverhorse has launched a Kickstarter campaign for The Hunger Games: MockingJay the Board Game! Panem is in revolt. After Katniss escaped from the quarter quell to the mysterious District 13, she joined an all-out rebellion. The Hunger Games: Mockingjay – The Board Game is a strategic board game where two to four players must employ all their wits in order to free or control Panem. Combat in The Hunger Games: Mockingjay – The Board Game is quick, the resistance make their rolls and the remaining Capitol units fight back meaning that districts can have a mix of Capitol and Resistance forces by the end of a turn. 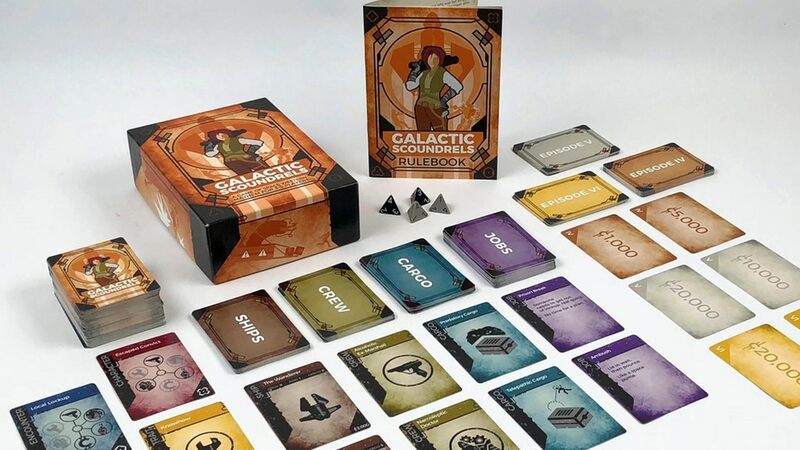 Galactic Scoundrels is a game made by and for people who love science fiction stories from the morally questionable end of the galaxy. From Firefly to Cowboy Bebop to Star Wars to Rick and Morty, the game has a trope for just about every scoundrel story out there, but it tilts toward the space western genre more than most. You have one goal in the game: to become the richest swindler in the galaxy, while telling some beautiful stories along the way. You’ll attempt this by agreeing to some not-very-nice jobs. Whether it’s an assassination, a kidnapping, or just an old-fashioned smuggling run, everyone playing tells the tale of each job one event at a time. Every action taken, every roll of the dice, every card played advances the story, complicating the adventure of the scoundrel who’s trying to make it to payday. Adventures can be serious or silly, tame or wild, absurd or plausible, whatever the players in your game decide. 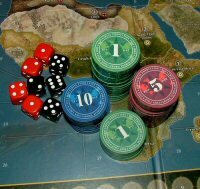 Along the way, the game will have you gambling, bluffing, negotiating, and occasionally tricking other players for a bit of extra profit. It’s a wild, woolly mess of a galaxy out there, and it’s filled with stories. See if you have what it takes to survive them in Galactic Scoundrels from Little Rock Games. The world’s cutest social deduction game has arrived on Kickstarter, with Jellybean Games launching the campaign for Hidden Panda, a hidden roles game for 5-8 players of all ages. From the designer of Dracula’s Feast and The Lady and the Tiger, ?with stunning art provided by Kelly Jo (Scuttle!, Ninjitsu), the bright colors and light-hearted theme breathe fresh air into the typically-gloomy genre. As with all Jellybean Games, the rules are straightforward and easy to learn. Everyone is randomly given a role: If you’re a Panda, Keeper, or Grandma, you’re on the Panda Team. If you’re a Bandit, you’re on the Bandit Team. Only some players on the Panda team know who’s on their team, while each Bandit only knows their own role. Grandma plays face-up for the entire game; her role is to try to get baby pandas to her fellow teammates without giving their roles away. This unique addition to social deduction makes it perfect for family play – the Grandma role can be given to an adult to help guide younger players. taken two turns, the team with the most baby pandas wins! The game contains 8 role cards, 45 baby panda tokens, 16 bamboo tokens, 6 net tokens, and 1 cup of tea token. Kickstarter backers will get a free, exclusive set of wooden baby panda tokens. Brace yourself, the backstabbing and intrigue of medieval Europe is being brought to life in the real world. Sort of. This morning at PDXCON, Free League Publishing and Paradox Interactive announced a kickstarter to bring the best-selling and award-winning game Crusader Kings to life as a tabletop board game. 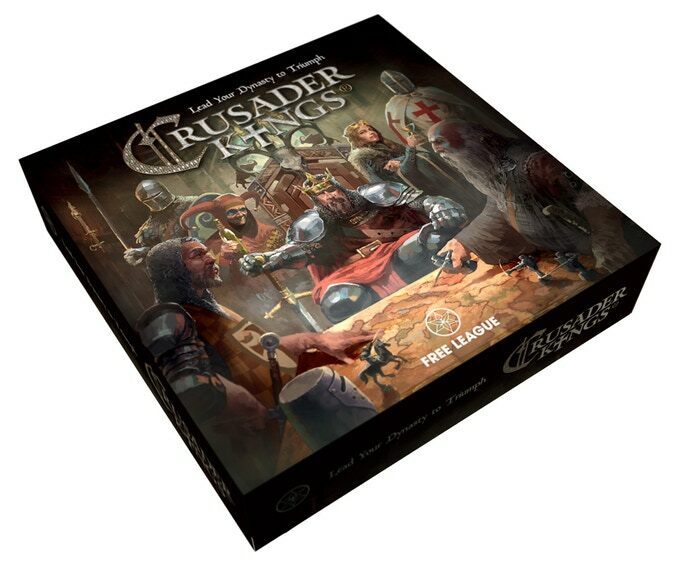 Crusader Kings The Boardgame will capture the strategy of the game and wreak havoc in homes all over the world as it is moved from the computer onwards to the tabletop. 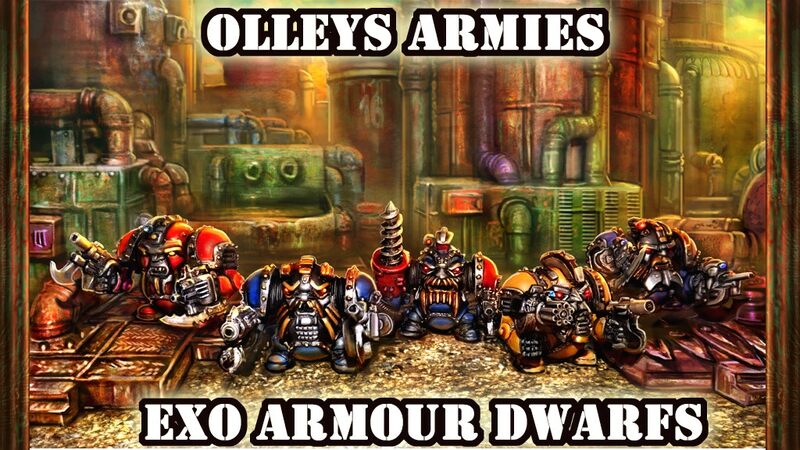 Let the people rejoice*! 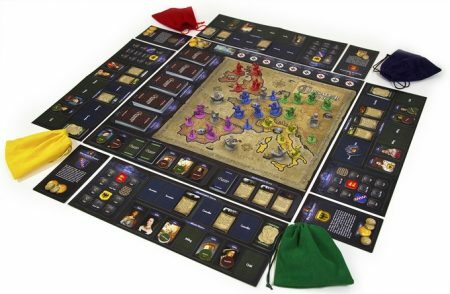 The boardgame is created by Free League Publishing, the development team behind the award-winning tabletop RPGs Tales from the Loop, Coriolis – The Third Horizon and Mutant: Year Zero. In this medieval strategy soap opera, your King or Queen will need to survive invasions, plots, crusades, and even marriage. Or at least have children, siblings or spouses standing by to take over the throne. Failure to raise a suitable heir could face you with the end of your dynasty. Oh dear! As a ruler, you need to be shrewd in the realm of diplomacy and intrigue and make and break alliances with others. Grow your wealth and military power, build and develop your dominion, while at the same time fulfill your duty to partake in the crusades to the Holy Land. All the while experiencing events of the strange and dangerous life of a medieval ruler. While at the same time matchmaking your family tree in order to groom your dynasty’s traits over the generations.